How Far Apart Can You Span a Ceiling Joist? Ceiling joists are a critical element of a house's structure. They not only support the weight of the ceiling material, but also bear the outward pressure that is placed on exterior walls from the weight of the roof. The spacing and allowable span of ceiling joists in residential construction is standardized according to building codes, which cover not only basic wall-to-wall room design but nonparallel ceiling joist construction as well. Ceiling joist spacing is crucial in home construction. The standard construction of interior framing in a home uses 16-inch on center (OC) spacing for ceiling joists. Joist spacing in this design mode incorporates different types of wood used in ceiling construction, including #2 grades of southern pine, Douglas fir and hemlock fir types, which are the most common. Basic ceiling construction is based on joists that run parallel to the rafters, although nonload-bearing walls used to split a room in half, for instance, may have nonparallel ceiling joists. The size of the ceiling joist also is accounted for in joist spacing. Although 2-inch by 6-inch lumber is used most often in ceiling construction to support 5-foot by 8-foot sheetrock — the material commonly used for ceilings — other sizes of lumber may be used, such as 2-inch by 4-inch and 2-inch by 8-inch lumber. Sixteen-inch OC spacing of ceiling joists made from #2 southern pine allows for a maximum 13-½-inch span (length). This will support a room ceiling that is 10 feet long on one side — as in 10-foot by 15-foot or 10-foot by 17-foot rooms — which is a standard dimension for many rooms in residential construction. Interior spaces that exceed standard sizes, such as family rooms and garages, require different dimensions in the size of the joist, the joist spacing and the joist span. In these cases, 2-inch by 10-inch lumber is often used for ceiling joists, although trusses may be more practical. 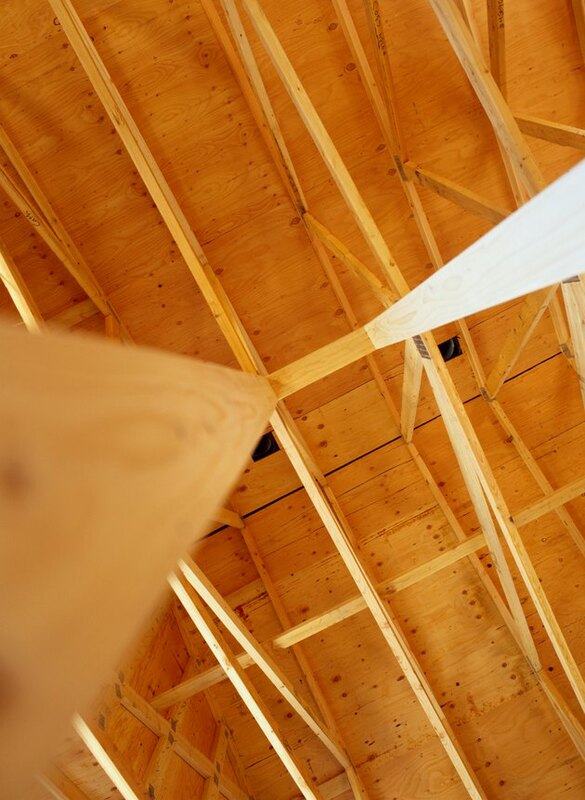 Spans for joists greater than 20 feet that are parallel to the rafters require a 12-inch joist spacing when using 2-inch by 10-inch #2 Douglas and hemlock fir or southern pine, or 16-inch spacing when using 2-inch by 10-inch #2 Douglas fir or southern pine. Joist spacing of 24 inches is allowed for spans between 16 to 20 feet using 2-inch by 10-inch lumber of these three grades. Nonparallel ceiling joist designs require additional support construction in the ceiling. According to the International Residential Code (IRC) from 2000, one of three methods may be used to maintain a continuous tie — support strength — across the rafters supporting the roof weight and outward pressure. You may use 1-inch by 4-inch cross-ties between rafters within the bottom third of the rafter span from the exterior walls, at a maximum of 4 feet in distance from the exterior wall plate. You may also use metal straps at the end of the rafters, or you may use metal tie connectors where the rafter meets the exterior wall plate. Joist spacing is standard for nonparallel ceiling joists, according to the IRC and building codes in general, although you will have to use ceiling joist hangers to attach the ends of the joists to the load-bearing wall plates that you will be tying into.